Paper gold offers several advantages over the physical metal. Here is what makes it a better investment option. Liquidity: You can buy and sell paper gold very fast. All it takes is the click of a mouse or a phone call to the broker. Gold ETF units are freely traded on stock exchanges and you can execute the transaction any time during market hours. Transparency in pricing: The price of paper gold is completely transparent. The price of an ETF unit is linked to the price of 1 gram of gold. There are no making charges or premiums involved. You only pay a small brokerage of 0.5%. Tax efficiency: Profits from gold ETFs and gold funds are treated as long-term capital gains and taxed at a lower rate (flat 10% or 20% with indexation) if the holding period exceeds one year. In case of physical gold, the holding period has to be three years before the profits are treated as long-term gains. Paper gold also does not attract wealth tax (except e-gold). Affordability: Paper gold is suitable for investment purposes because it can be bought in small denominations of 1 gram. Some companies even offer 500 mg units. It is not possible to buy gold jewellery in very small denominations. The smallest ornament would weigh about 4-5 grams. Assurance of purity: There's no need to worry about the purity of gold while buying ETFs. 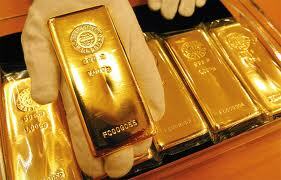 Gold ETFs are required to hold equivalent quantity of gold bullion of 99.5% purity. In physical gold, the buyer has to ensure that he gets the purity he has paid for. Convenience and safety: Physical gold can be stolen and, therefore, needs to be stored in a locker. Gold ETF and e-gold units are held electronically in the demat form. The gold fund of funds can be either in the demat form or held with the custodian. Conversion possible: Paper gold can be converted into physical gold by rematerialisation. Till now, e-gold was the only form of paper gold that allowed conversion to physical gold. Now, gold ETF units can also be exchanged for bullion.